Palestine ( 2008 ) 89 minutes. We live at such a remove these days, what with e-mails, IMs, text messaging, vid cams, and all the rest, that it didn’t surprise me whenI got a terse e from someone I’d been " chatting with " online which said — " We have nothing in common. " Which, I suppose, is just one person’s way of saying that we’re not connected, or rather interconnected, as the Buddhists would say. But that’s a funny how do you do when whole cultures can be at your fingertips just by typing something in on your pc. These things came through loud and clear in Jackie Salloum’s first — documetary — feature SLINGSHOT HIP HOP, when one of the rap artists in it said how thrilled he was at the prospect of finally meeting someone he’d been chatting with online and on the phone. The artists here have much to say — and sing — about what they’ve gone through and continue to go through as second class Arab citiizens in " the state of Israel". And let’s not forget that that the forced Palestinian exodus has been erased even within their own culture, and that their story is hardly known, especially in the USA. Or, as that Milwaukee grandma Golda Meir once famously declared — " There were no Palestinians. " Which could be her way of saying that the completely planned, fully armed, and lavishly funded Zionist cleansing of Palestine in the 1948 war successfully deleted an entire people from history. That systematic disposession, which the Israeli historian Ilan Pappe — http://www.ilanpappe.com/— documents in his harrowing book The Ethnic Cleansing of Palestine ( itals? ), is the Nakba or catastrophe suffered by the Palestinians — the expulsion / flight of three quarters of a million people from their cities,towns and villages. Hundreds were destroyed, and many massacres committed. 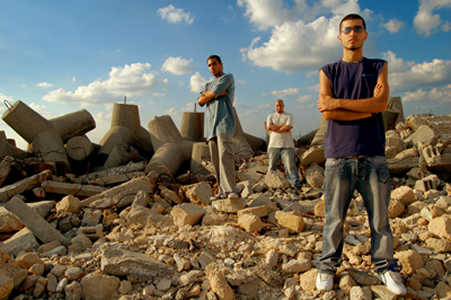 The Naher brothers, who form the backbone ofthe film, and their cousin Mahmoud Jreri. known collectively as DAM, are from Lid, which Pappe says was brutally cleansed in the ’48 war — hundreds were murdered, many in the mosque — the population driven out by massive aerial bombardment. They know their history, and decry Lid’s rampant drug use — the worst in the Middle East — as they walk by a school which the Israelis have turned into a police station, the smiling faces of children staring into the camera and flashing the peace sign as they talk. Rap, for DAM,is both a literary — they mention the late great Palestinian and Syrian poets Mahmoud Darwish and Nizar Kabbani,Tupac and others as inspirations — and political tool. DAM was founded in 1999 but really took off when Ariel Sharon provoked the second intifada in 2000 by going to Jerusalem’s Temple Mount / Dome of The Rock, with hundeds of soldiers around him, allegedly to pray. This inspired their first single, " Who’s the Terrorist? " , which turns the American media’s version of Palestinians as just naturally crazed bloodthirsty Arabs on its head by saying who’s really terrorizing whom — and it’s the IDF ( Israeli Defense Forces ) –andnotyouths defending their ( itals ) land with slingshots, or millions of unarmed civilians.. The skillful work of Salloum’s animators, plus file footage, backed by Suheil Naher’s resonant narration, provides the context for the ’48 and ’67 wars’ expulsion of the Palestinians.The film alsoshows how the sense of physical and psychological loss ofpersonal identity — Darwish’s seminal poem " Identity Card " is cited — from these historic events continues to haunt the Palestinian people. And how living under daily occupation, as are DAM, and their cousin from Lid, Abeer,is an inhumanexperience — she was forbidden to speak her native tongue, Arabic, at her job in Tel Aviv.But Abeer becomes a rap artist and a very magnetic one at that, despite or because the resistance she gets from some of her family. Her song, " The Sound of Silence", which she performs here, is as poweful as it is profound. And we see wonderful performances by DAM and other equally gifted artists, including some from Gaza, whose audiences — especially one in that besieged area — respond as if these songs were written espressly for them. Art has a way of making things right — Kafka said it breaks " the frozen sea within us " — and if it doesn’t do that, it sometimes can at least make things bearable. Salloum’s film puts the 60 plus years of the Palestinian struggle center stage. And it’s amazing that a story this sad — we see the Apartheid Wall landgrabbing its way through the West Bank. a Gaza apartment house after it’s been bombed. the hours’ long waits at checkpoints– should be so uplifting and entertaining. But SLINGSHOT HIP HOP manages to be that. It also invalidates a certain famous statement by Meir. " How can we return the occupied territories ( the West Bank ) when there’s no one to return them to? " We all share one common humanity despite what anyone says, thinks, or does.